Directions: From US 441/23 in Franklin, drive 11.7 miles west on US 64 and turn left on Old Murphy Road at the sign for Standing Indian Campground. Proceed 1.9 miles and turn right onto FR 67. After 1.7 miles the road forks. Take the right fork into the campground and turn left into the day-use parking area after 0.1 mile. 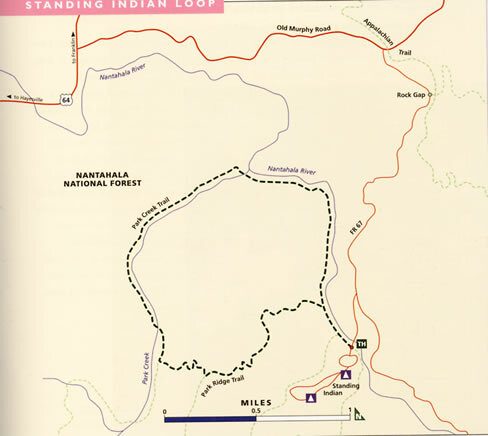 The Standing Indian region of Nantahala National Forest is popular with hikers, equestrians, trout fishers, and car campers. The loop hike outlined here uses some of the lesser-traveled trails, so you can expect to have much of this hike to yourself. 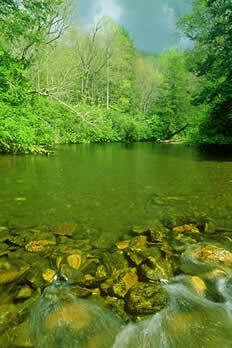 However, plan on some company along the first section that closely parallels Nantahala River. Begin the hike by walking on the paved road toward the camping area (away from the camp store) and crossing over Nantahala River. On the other side of the bridge, look for the trail turning right and heading downstream. The trail passes through dense rosebay rhododendron, some of the largest I’ve seen, and soon comes to a junction with Kimsey Creek Trail, cutting back to the left. Just before crossing a small branch at 0.25 mile. Park Ridge Trail turns to the left. You use that trail on the return; for now, continue straight ahead on Park Creek Trail. and both the white and purple color forms of wake robin. Also growing in the patch is ramps, but you see only the basal leaves in spring. and the foliage of numerous wildflowers that had either finished flowering or hadn't yet started. Spend some time exploring and there's no telling how many species you'll see. You have to cross Park Creek at 2.8 miles, which normally is an easy matter, but after heavy rains you might have to wade. After crossing, continue heading upstream and come to the Park Ridge Trail connector on the left after about 250 yards. If the sign is missing and you don't pay attention, you could walk right by the path and not know it. So pay attention. and both color forms of wake robin. Also, the leafy green foliage of mountain bunchflower is everywhere. At one point the squawroot grows so profusely in the middle of the trail that you can’t help but step on it. The purple-veined basal leaves of rattlesnake weed are prominent, but the yellow flowers usually don’t appear until May. At a few locations the trail swings briefly onto north-facing slopes that have large-flowered trillium, baneberry, and mountain bunchflower foliage. A few large-flowered trillium grow scattered on the drier slopes, but not much. The trail picks up a small drainage and crosses the branch a few times through dense rosebay rhododendron before finally reaching the trail junction. This final stretch through the rhododendron is a good place to look for painted trillium. Turn right at the trail junction and retrace the route to the parking area.